Provide comfort for the family of Floyd Ramseyer with a meaningful gesture of sympathy. Floyd E. a.k.a. 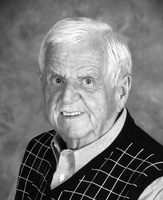 Fred Ramseyer, age 93, of Orrville, passed away Sunday, March 31st, 2019 at LifeCare Hospice in Wooster. Fred graduated from Smithville High School in 1943 and in 1945 began his career as a bricklayer working for Galen Hochstetler. This crew then worked for C.A. King Construction where he developed many life-long friendships. He met the love of his life, Joan April Newman, at a square dance at Smithville High School.On June 4, 1949, Fred and Joan were married at Smithville Brethren Church. She passed away on July 2, 1983. Fred departed in December of 1945 on the ship S.S. Park-Victory for Poland. This was a post WWII relief mission. They were called the Seagoing Cowboys and transported horses and cows to replenish the livestock after WWII. In March of 1946, Fred returned from Poland and in 1948 he enlisted in the U.S. Navy and was stationed at National Medical Center in Bethesda, MD. and was honorably discharged from the Navy. Fred began working as a grill cook and host at Howard Johnson's in Wooster ("Planks"). Fred worked on the first day it opened and the last day in 1990 when it closed. In 1967, Fred joined the sales team at the J.M. Smucker Co.
Fred and Joan had a great passion for traveling all over the United States and Europe. Fred continued traveling with friends for the remainder of his life. He was a life long member of Smithville Brethren Church; was an avid card player and enjoyed games with many of his friends until his death. He also enjoyed biking, hiking, playing piano and talking on the phone. Surviving is his daughter, Victoria (Bob) Carpenter of Dalton, ; his grandsons, Tony (Stefanie) Carpenter of Dalton, and Michael (Jobeth) Carpenter of Orrville; he loved his family very dearly but adored and treasured his four great-granddaughters, Olivia and Sophia Carpenter (Tony and Stefanie's daughters) and Adeline and Saige Carpenter (Michael's daughters),; and a brother, Homer (Bessie) Ramseyer; 6 nieces, Judy, Kathie, Karla, Peggy, Linnea and Patricia; 4 nephews, Miles, Tom, Stephen and Jimmy. In addition to his parents and beloved wife, he is preceded in death by his sisters, Bernetha (Maynard) Beery, Viola (A.L. Mose) Moss and Esther (William) Moses. Services will be Monday, April 8th, 11:00 a.m. at Smithville Brethren Church with Pastor Art Carr officiating. A private family interment will follow at Smithville Cemetery where military rites will be conducted by The 555th Honors Detachment. Visitation will be one hour (10:00 - 11:00 a.m.) prior to services at the church. The family requests your presence for a celebration of life at the Pines Restaurant in Orrville following the services. Memorial contributions may be made in lieu of flowers to either; Akron Children's Hospital c/o The Heart Center Considine Professional Building 215 W. Bowery St., Akron, OH 44308 or Cure JM Foundation P.O. Box 45768 Baltimore, MD 21297-5768. A special thanks to his life long friends, Don and Vicki Dreher and Jim and Germaine Gerber. It is with great gratitude for the loving and devoted care given by the aides from No Place Like Home as well as, LifeCare Hospice for their respectful and superb care given to Fred during his stay. To send flowers in memory of Floyd E. "a.k.a. Fred" Ramseyer, please visit our Heartfelt Sympathies Store. We encourage you to share your most beloved memories of Floyd here, so that the family and other loved ones can always see it. You can upload cherished photographs, or share your favorite stories, and can even comment on those shared by others. Provide comfort for the family of Floyd E. "a.k.a. Fred" Ramseyer by sending flowers. One only has to look at Fred's family (devoted daughter & son-in-law, Vicki & Bob Carpenter, along with his adoring grandchildren & great grandchildren) to understand what kind of a man he was. His legacy speaks volumes about his core values & ability to form & nourish close relationships. We share our deepest sympathies with all members of his family & understand only too well how much he will be missed.